Stalin’s death did not mean the end of the regime’s crimes. 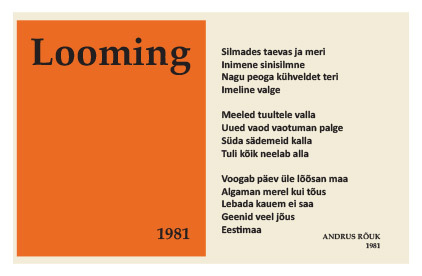 1956 was the year in which many of the Siberian exiles and Gulag prisoners started returning to Estonia. The return home was not without problems. For one thing, they were not to get their homes back and even faced obstacles returning to their hometowns. In many cases, this was not even possible, possessions had been scattered and redistributed. For the most part, relatives gave the returnees a roof over their head, as the deportees could not move back into their own homes. 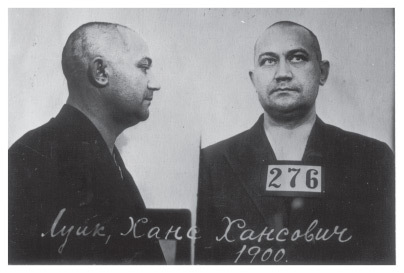 Although the deportees and political prisoners were released, they remained under KGB scrutiny practically until the end of Soviet rule. They continued to be regarded as an anti-Soviet element. They remained on file in the “register of sins” that could be used against them if needed. 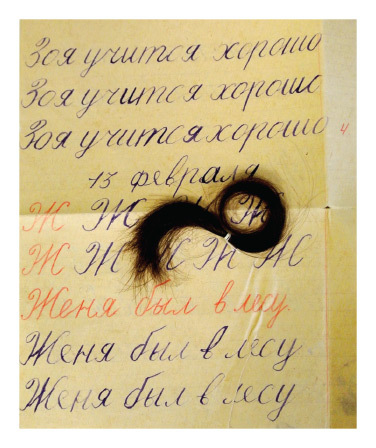 LOCK OF HAIR FROM SIBERIA. 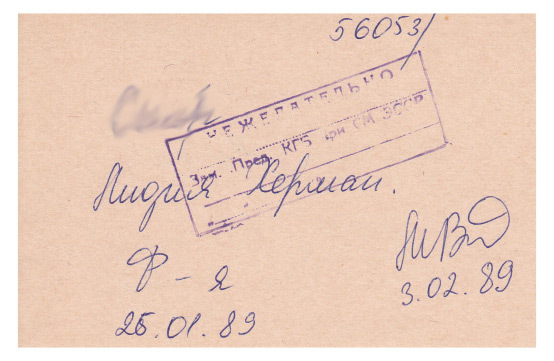 SECURITY SERVICES CHECKED PRISONER CORRESPONDENCE AND CONFISCATED “UNDESIRABLE” LETTERS. 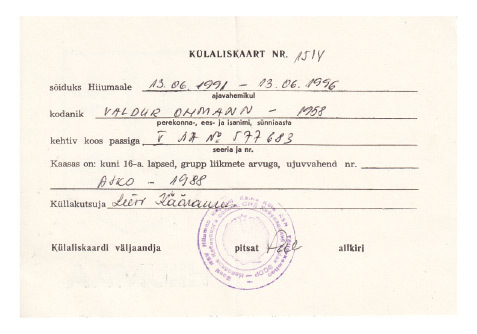 A LOCK OF A DEPORTEE’S HAIR AND THE FIRST ATTEMPTS AT RUSSIAN DID NOT MAKE IT BACK TO THOSE BACK HOME IN ESTONIA. 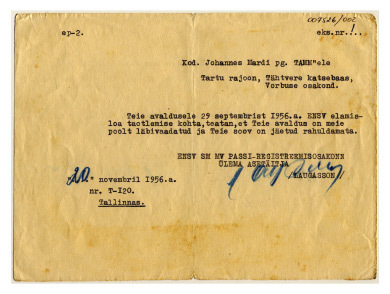 A NOTICE FROM THE SUPREME COURT OF THE ESTONIAN SSR INFORMING M. AINSAAR THAT HE HAD BEEN RELEASED FROM EXILE AND THAT HIS POSSESSIONS WOULD NOT BE RETURNED. 1957. 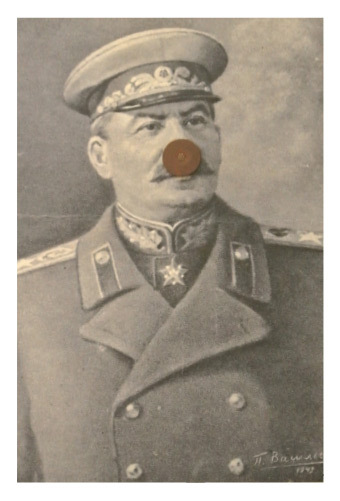 PUSHING A TACK INTO STALIN’S NOSE MEANT CRIMINAL PROCEEDINGS AND A 10 YEAR SENTENCE. THE FILE ON ONE DEPORTEE. 1949-1954. Starting in the second half of the 1950s, dissidents were singled out for attention by the KGB. The KGB conducted surveillance and arrested people who read or exchanged texts from the West, or expressed support for the West, drew attention to human rights violations or called for democracy. The main form of expression for dissidents was samizdat – self-published works typed on a typewriter. 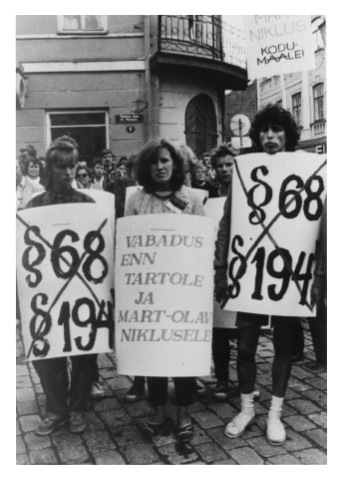 The Estonian dissident movement was mainly based on the idea of restoring Estonian independence and an end to the occupation. The Soviet regime expressed extraordinary intolerance with regard to dissidents. Many dissidents were convicted under criminal procedure. 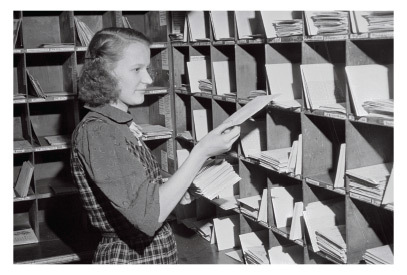 ALL OUTGOING AND INCOMING MAIL TO AND FROM THIS FAMILY IS TO BE READ THROUGH!” 23 JULY 1952. DEMONSTRATION CALLING FOR THE RELEASE OF ENN TARTO AND MART NIKLUS. 14 AUGUST 1988. DISSIDENTS’ LETTER TO THE UN GENERAL ASSEMBLY. 1972. 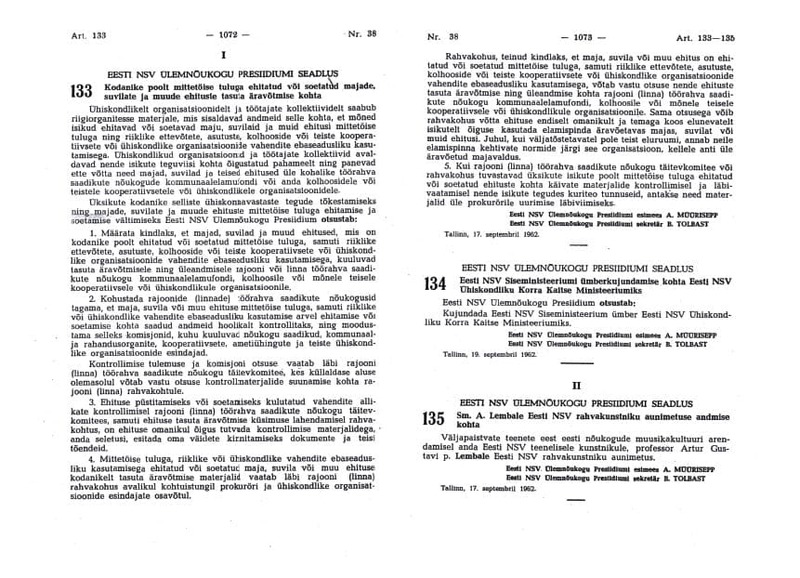 The Baltic Appeal was a memorandum from 45 citizens of Estonia, Latvia and Lithuania addressed to the UN Secretary General, West and East Germany and the signatory states to the Atlantic Charter demanding that the Molotov Ribbentrop Pact and its secret protocols be made public, the pact be declared null and void and the independence of the Baltic states be restored. The final text of the Baltic Appeal was prepared in the home of Mart Niklus and made public on 23 August 1979. The KGB immediately began hounding the authors and disseminators of the letter. Some of them were imprisoned. 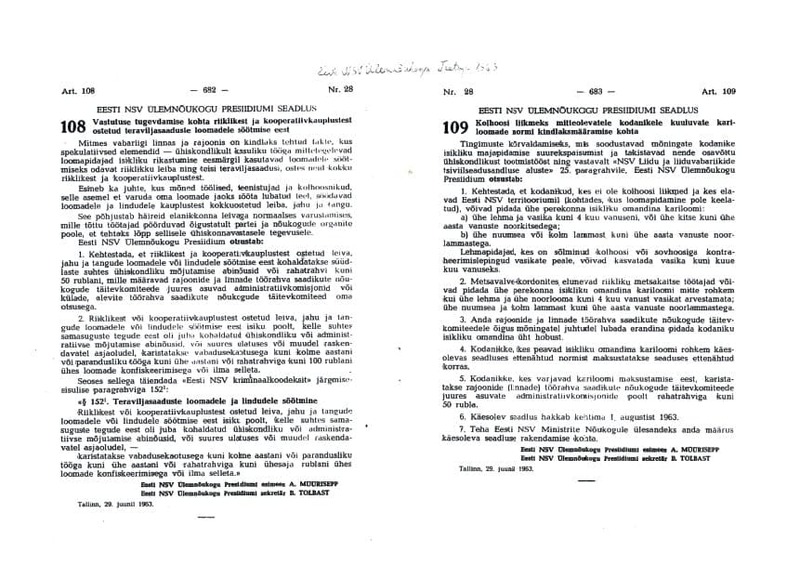 In 1980, the document that would be known as the Letter of the 40 Intellectuals appeared, expressing concern over Russification in Estonia. Attempts were made to dissuade the signers from participating in the gesture and four scholars who signed the letter were fired. A DETAIL FROM A FILE CONTAINING THE DISSIDENTS’ LETTER TO THE UN GENERAL ASSEMBLY. 1975. 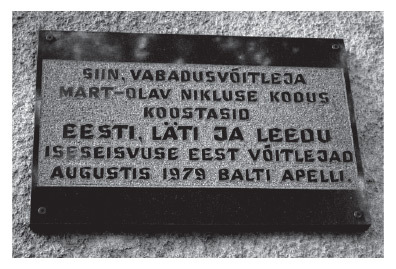 BALTIC APPEAL PLAQUE ON THE WALL OF THE HOME OF MART NIKLUS. 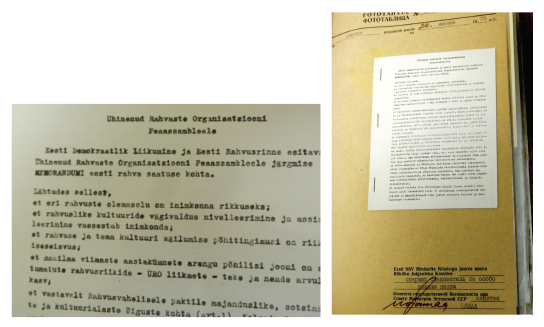 MEMORANDUM FROM THE CITIZENS OF ESTONIA, LATVIA AND LITHUANIA to the UN SECRETARY GENERAL, KURT WALDHEIM AND LEADERS OF MAJOR POWERS. ESTONIAN DISSIDENTS MART NIKLUS, ENDEL RATAS, ENN TARTO AND ERIK UDAM ARE THE SIGNERS. 23 AUGUST 1979. 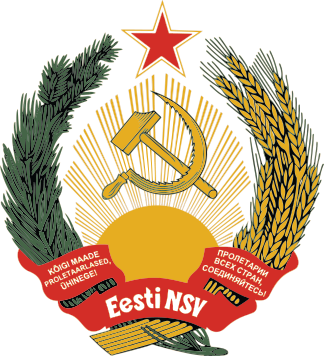 In the Soviet Union, the use of the symbols of the Republic of Estonia was strictly forbidden and a punishable offence. The prohibition of “bourgeois” symbols even went to extreme lengths. For instance, a blue-black-and-white national tricolour that found its way into a magazine by accident might result in all of the copies being removed from circulation. The national flag was frequently raised on Independence Day starting in the late 1970s. Punitive action often followed such expressions, including sentences of various lengths. 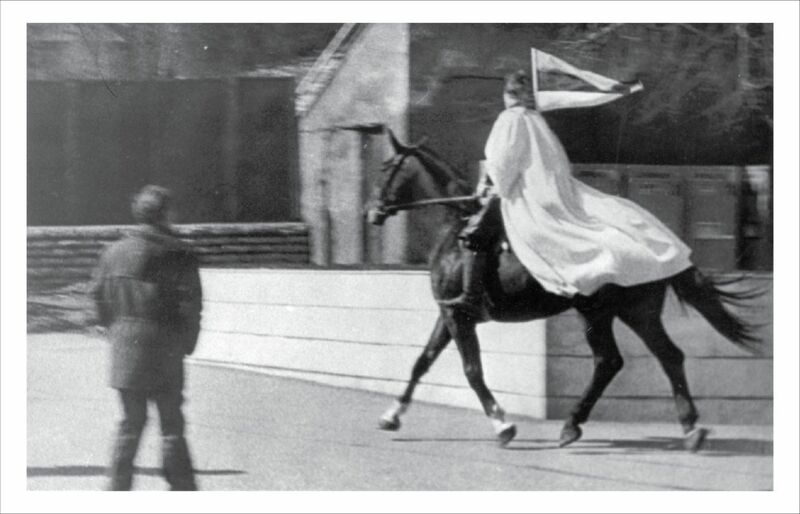 ON 24 FEBRUARY 1987, THE MUSICIAN E. JÕGI RODE UP TOOMPEA HILL WITH A NATIONAL TRICOLOUR MEASURING 44 x 77 CM WAVING PROUDLY. 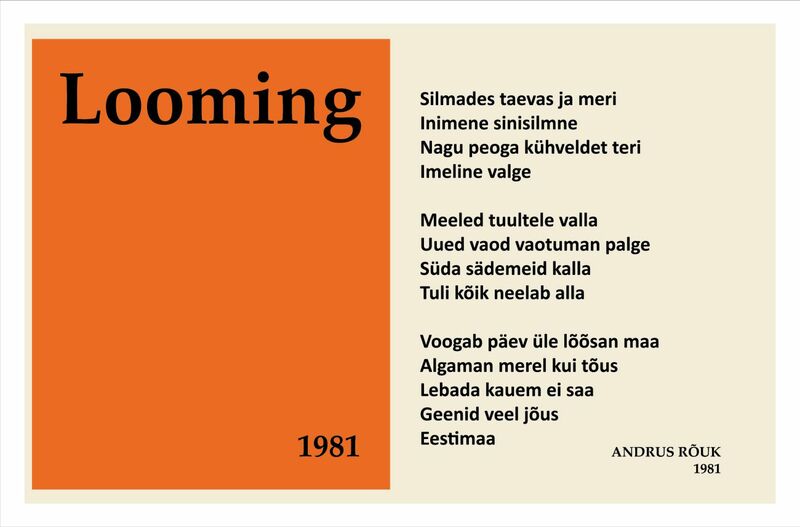 A. RÕUK. POEM ENTITLED “THE SKY AND SEA IN EYES” SPELLED OUT AN ACROSTIC MESSAGE WHEN THE FIRST LETTERS OF EACH LINE WERE READ VERTICALLY: “BLUE, BLACK AND WHITE”. AS A RESULT, THE POET WAS EXPELLED FROM THE ART INSTITUTE. LOOMING MAGAZINE NO. 9, 1981. 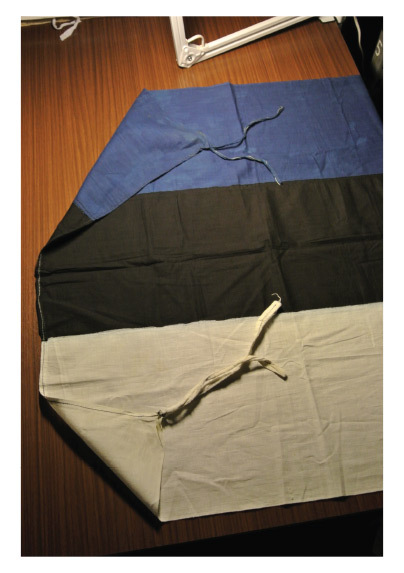 THE HOMEMADE ESTONIAN FLAG FLOWN IN TÕRVA IN 1962. 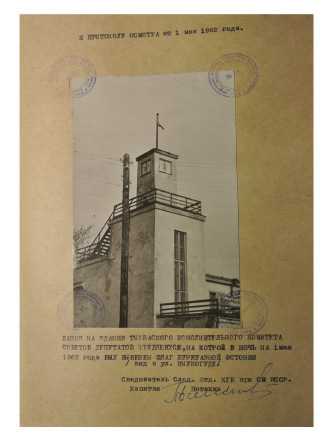 A BLUE-BLACK-AND-WHITE FLAG ATOP THE TOWER OF THE EXECUTIVE COMMITTEE BUILDING OF THE EXECUTIVE COMMITTEE OF THE WORKING PEOPLE’S DEPUTIES OF THE CITY OF TÕRVA. 1 MAY 1962. A saying attributed to Soviet premier and party leader Nikita Khrushchev: “Only a madman would resist socialism.” In the 1960s, it became more common for dissidents to be involuntarily committed to mental hospitals. 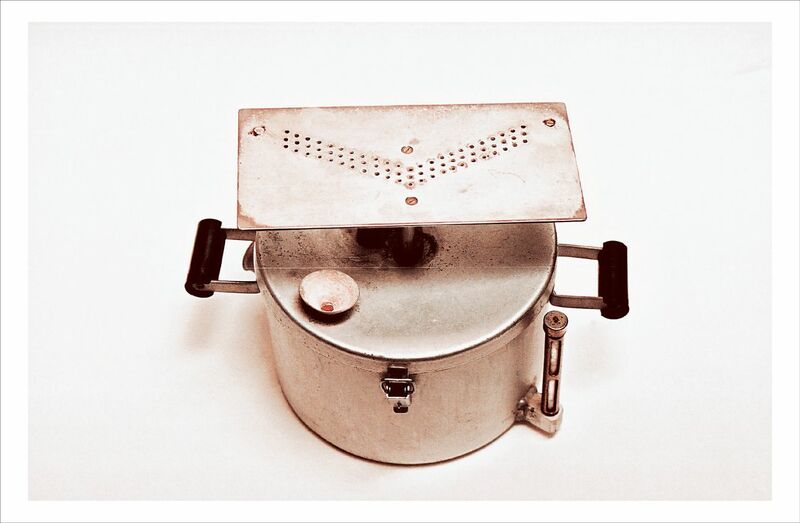 It was one tool in the arsenal of Soviet political persecution methods. 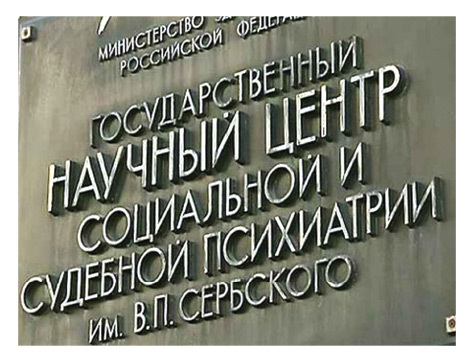 The best-known psychiatric hospitals where dissidents were committed were Moscow’s Serbsky State Scientific Centre for Forensic Psychiatry and the Chernyakhovsky specialized psychiatric hospital. Specialized psychiatric hospitals were guarded by internal security units, like prisons and prison camps. 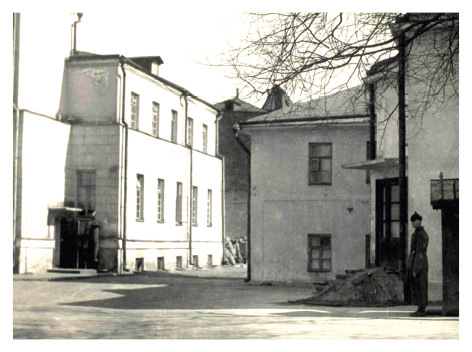 MANY DISSIDENTS WERE CONFINED TO THE SERBSKY INSTITUTE OF FORENSIC PSYCHIATRY. THE SERBSKY INSTITUTE OF FORENSIC PSYCHIATRY WITH MILITARIZED SECURITY. 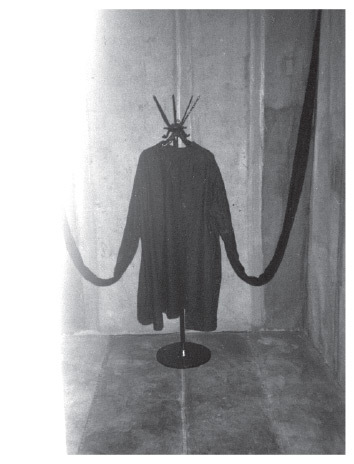 STRAITJACKET IN THE LITHUANIAN GENOCIDE MUSEUM. By the Marxist definition, law was the will of the ruling class. Soviet justice was a new, qualitatively higher law, as it was seen as expressing the will of the broad, hitherto exploited masses, with the Communist Party as its advance guard. 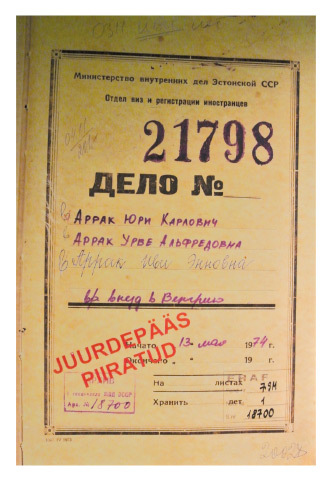 Injustice and inhumanity were thus encoded into the Soviet legal system. The Soviet legal system as the instrument of the totalitarian state served only the interests of the ruling party, the CPSU. Soviet law also lacked the generally recognized principle that everyone is equal before the law. THE JUDICIARY WAS POLITICIZED. 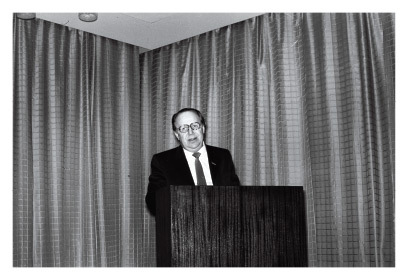 THE CHIEF JUSTICE OF THE SUPREME COURT OF THE ESTONIAN SSR, R. SIMSON, SPEAKS AT POLITICAL DAY IN THE EDUARD VILDE KOLKHOZ IN THE PÕLVA RAYON. 1983. A TEACHER AT TALLINN SECONDARY SCHOOL NO. 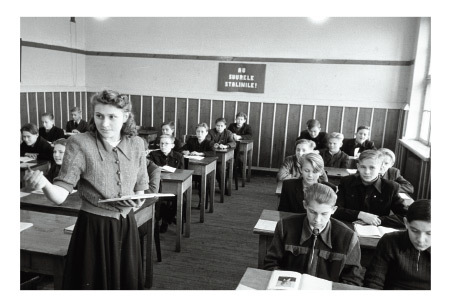 17, V. TAMM, TEACHES THE SOVIET CONSTITUTION. 1951. THE SOVIET LEGAL SYSTEM WAS ALSO IMPLEMENTED IN THE USSR’S SATELLITE STATES. PICTURED: A DELEGATION OF JUDGES FROM POLAND AT A RECEPTION AT THE ESTONIAN COMMUNIST PARTY CENTRAL COMMITTEE. 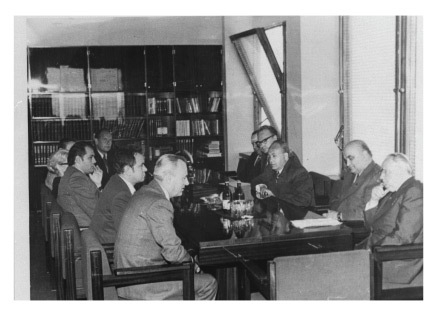 FROM RIGHT: ECP CC FIRST SECRETARY JOHANNES KÄBIN, USSR MINISTER OF JUSTICE V. TEREBILOV, ESTONIAN COMMUNIST PARTY CENTRAL COMMITTEE DEPARTMENT HEAD P. VASSIKOV, ESTONIAN SSR SUPREME COURT CHIEF JUSTICE R. SIMSON. 1977. The judiciary in the Soviet Union was different to that of a democracy governed by the rule of law. The Soviet Union needed a legal system so that formal hallmarks of law could be used to justify and conceal ideologically motivated violence. In countries governed by the rule of law, the idea of repression is part of the concept of punishment. Repression is something that is only allowed for actions defined as crimes, using legal means and judicial procedure. In Soviet society, on the other hand, many extrajudicial punitive sanctions were used. Thus the USSR could not be said to be operating under the rule of law, even though it had a formal legal system. H. LUIK. A PERSON IN DETENTION. SECURITY ORGANS HELPED TO CARRY OUT EXTRAJUDICIAL REPRESSIONS. 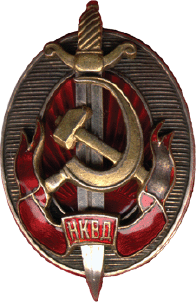 NKVD OFFICER’S DECORATION. 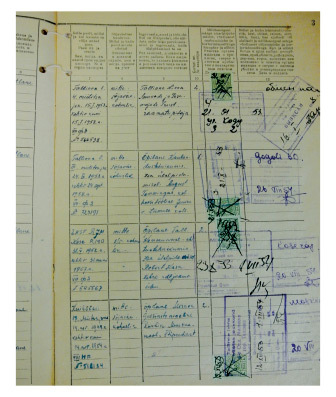 Dissidents, political opponents and those who corresponded with foreigners (including their relatives among the émigrés) were placed under covert surveillance. The surveillance was performed by the relevant KGB structural units. The snooping on correspondence started as soon as Soviet rule was established. Telephone wiretapping was also used. In democracies, covert surveillance can be a police tactic, but one that is regulated by legal acts. In the Soviet Union, surveillance was a human rights violation as it took place indiscriminately, in uncontrolled fashion, without following definite rules, and for political purposes. SOVIET SECURITY APPARATUSES PRACTISED OPENING AND READING PRIVATE LETTERS. SORTING LETTERS AT TALLINN’S MAIN POST OFFICE. 1958. 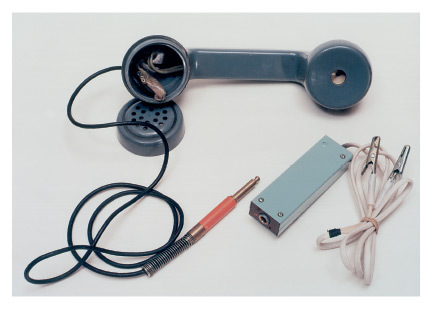 THE KGB USED TELEPHONE COMMUNICATION IN ITS OWN INTERESTS, LISTENING IN ON PHONE CALLS. TELEPHONE OPERATORS AT WORK. 22 JANUARY 1958. 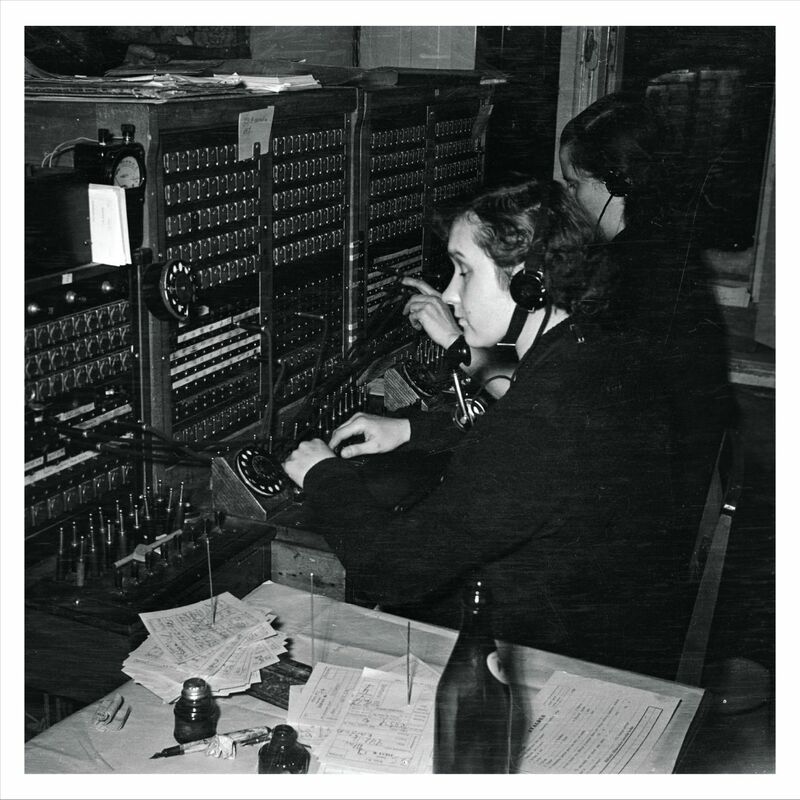 THE FOREIGN CORRESPONDENCE CENSORS’ DEPARTMENT WAS LOCATED ON THE FIFTH FLOOR OF A TALL BUILDING AT BALTIC STATION. 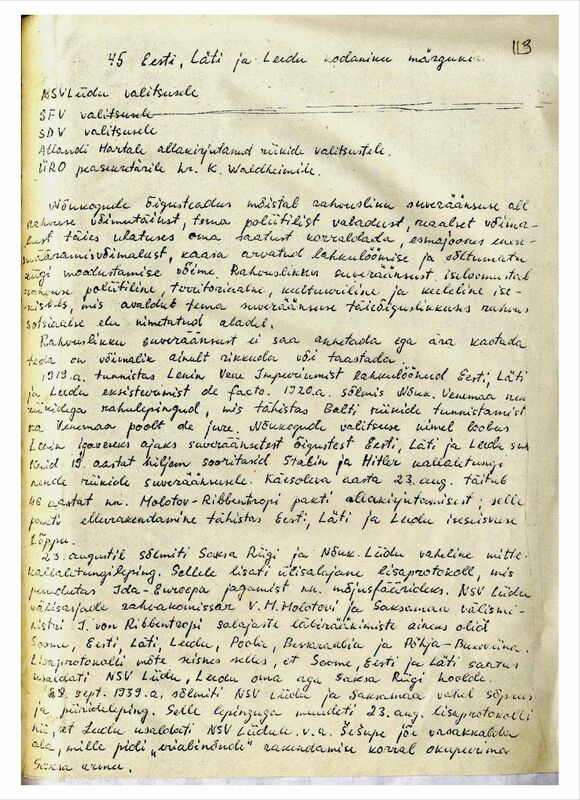 IT STAFFED THE WIFE OF ESTONIAN SSR LEADER JOHANNES KÄBIN: IF ANY PART OF A LETTER SEEMED SUSPICIOUS TO THE AUTHORITIES, A DOSSIER WAS OPENED ON THAT PERSON IMMEDIATELY. The Soviet system made use of the term “former people” (byvshie lyudi in Russian). That was the name for officials from the former regime, businessmen and owners, military and police officers. They were the targets of repression. That was not all: their children were also punished for who their parents were. Parental origin and status and other aspects were taken into consideration for hiring, entering university, and the waiting lists for getting an apartment and buying a car. A “social mechanism” started functioning where the working class was given preferential treatment. Collection and processing of personal data was oriented at that goal. 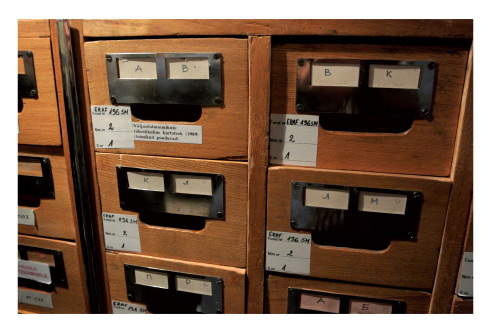 The data kept on file for people included their social origin and whether they belonged to the CPSU or the Komsomol. 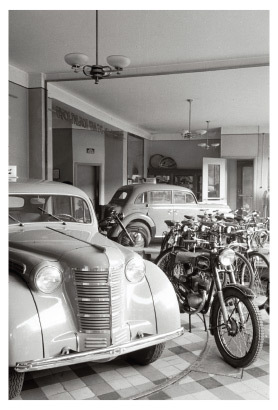 TO BUY A MUCH SOUGHT-AFTER AUTOMOBILE, ONE HAD TO HAVE OFFICIAL PERMISSION. A CLEAN RECORD GAVE ONE A MUCH BETTER POSITION FOR DOING SO. CAR DEALERSHIP ON PÄRNU MAANTEE, TALLINN. 1955. 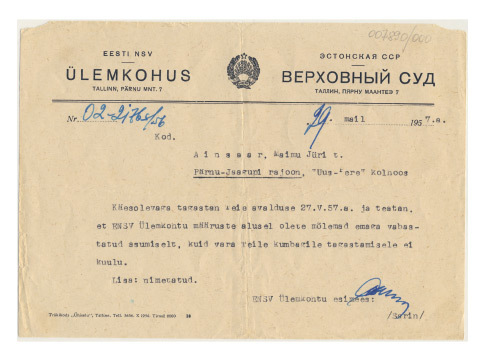 THE GRANDSON OF ESTONIA’S INTERWAR PRESIDENT WAS INITALLY NOT ADMITTED TO UNIVERSITY, AND LATER FIRED FROM A POSITION FOR POLITICAL REASONS. 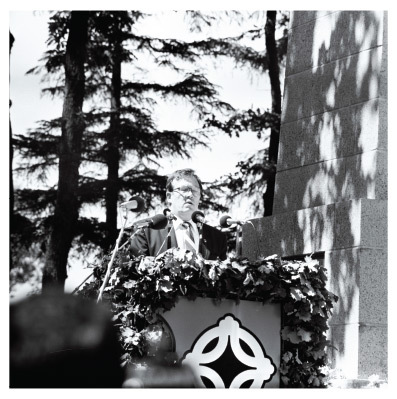 RE-OPENING OF THE MONUMENT TO PRESIDENT KONSTANTIN PÄTS IN TAHKURANNA. THE GRANDSON, PATENT OFFICE DIRECTOR MATTI PÄTS, DELIVERS A SPEECH. 25 JUNE 1989. A SCENE FROM THE V. GROSS PLAY “THE FORM”. 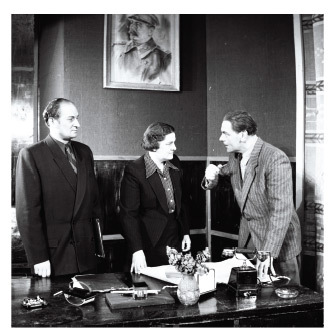 FROM LEFT, V. RATASSEPP IN THE ROLE OF HEAD ENGINEER O. HÄRMI, M. LUTS AS PARTY ORGANIZER R. MARIPUU AND R. NUUDE AS COMBINE DIRECTOR P. SAAR. 1953. 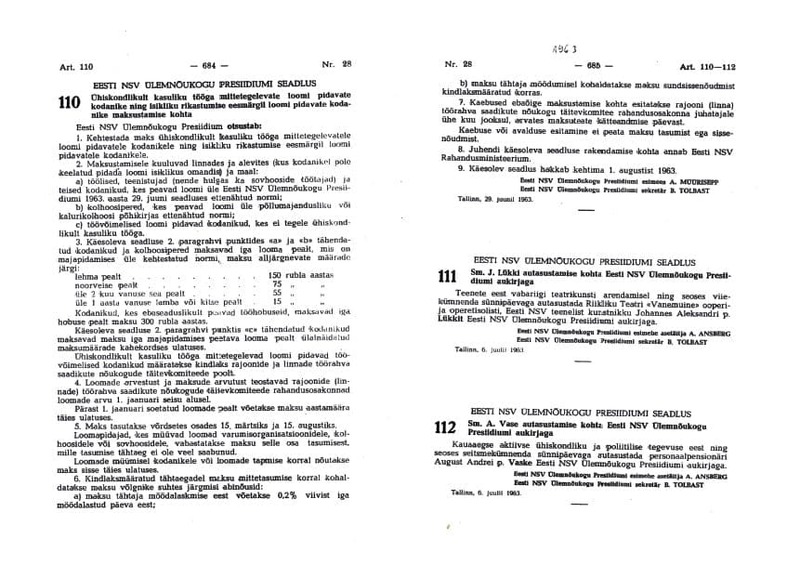 Besides passports for foreign travel, the USSR also had a domestic passport that regulated travel within the country. 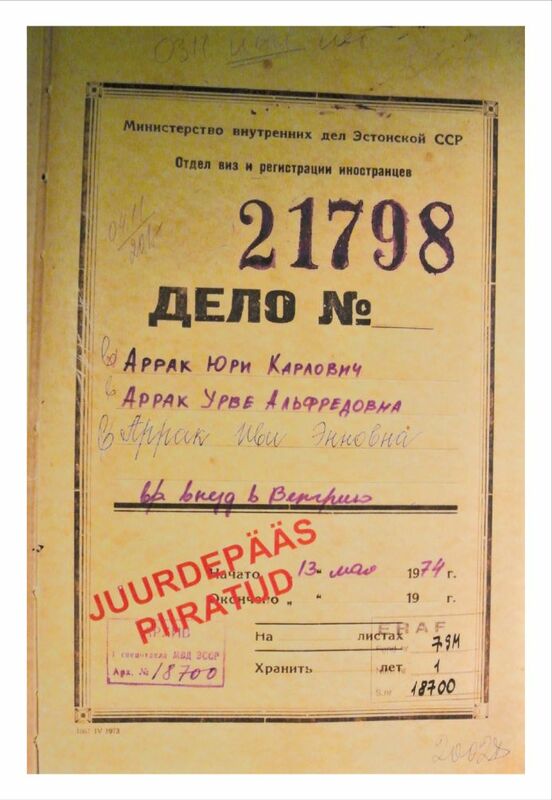 On the basis of claimed passport violations, Finns were deported to Siberia in 1947 and Ingrian Finns were exiled to an area on the Russian side of Lake Peipus; a marking was made in their passports. Siberian exiles and political prisoners were forbidden from living in certain areas, such as larger towns, after their return. In some cases, they were not allowed to set foot back on Estonian SSR soil. 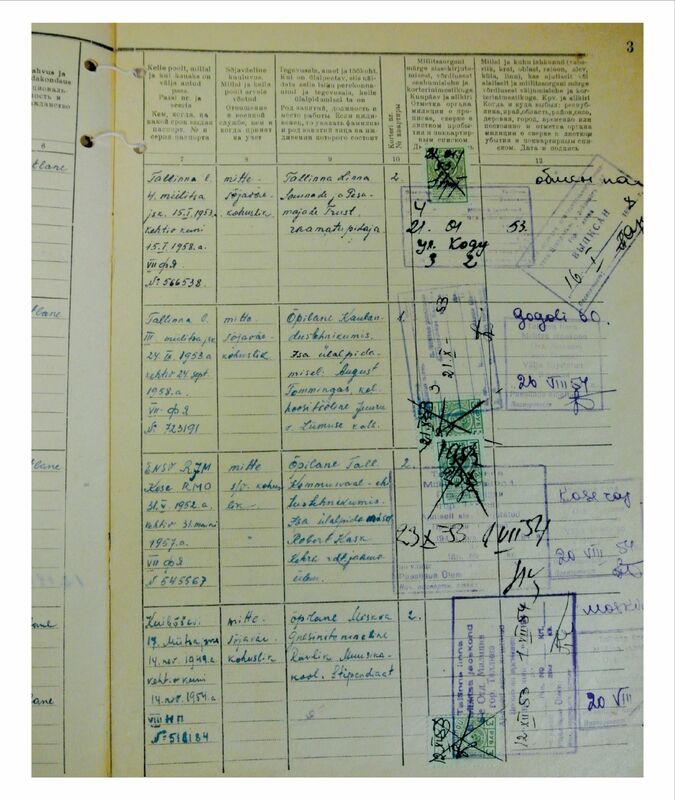 Building proprietors were required to register in a house log book all guests and residents who stayed or lived on premises for more than three days. The militsiya, the civilian police, oversaw the passport system. 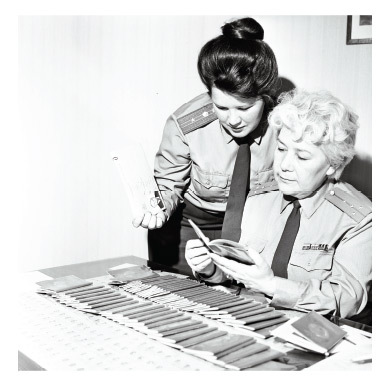 SENIOR INSPECTORS OF THE PASSPORT PRECINCT OF THE INTERNAL AFFAIRS DEPARTMENT OF THE TALLINN SEA RAYON – L. MIHHAILOVA AND JUNIOR LIEUTENANT OF THE MILITISIYA M. KOUGIJA CHECKING PASSPORTS BEING ISSUED. JANUARY 1976. NOTICE NO. T-120 20. 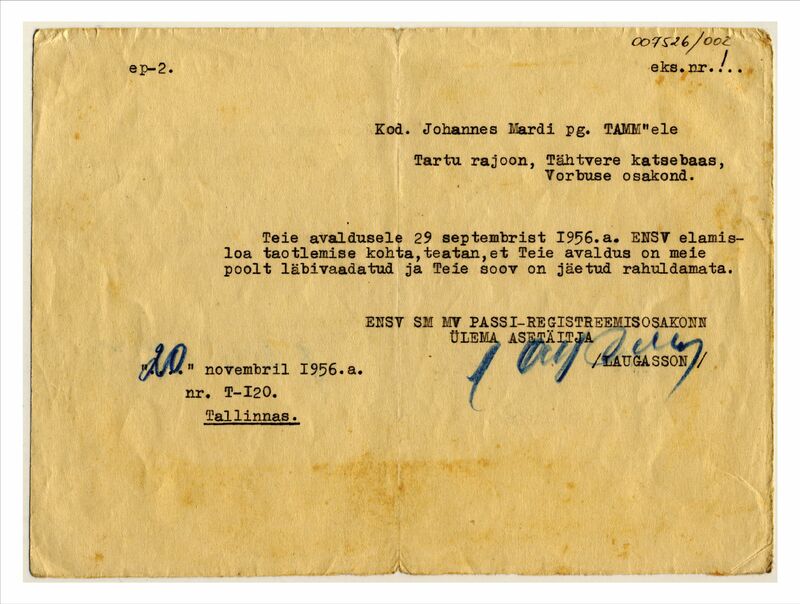 NOVEMBER 1956, REGARDING DENIAL OF RESIDENCE PERMIT TO ONE J. TAMM, ESTONIAN SSR INTERIOR MINISTRY MILITSIYA ADMINISTRATION PASSPORT REGISTRATION DEPARTMENT’S DEPUTY HEAD LAUGASSON. A DOSSIER OF AN INDIVIDUAL WITH RESTRICTIONS ON FREEDOM OF MOVEMENT. 1974. 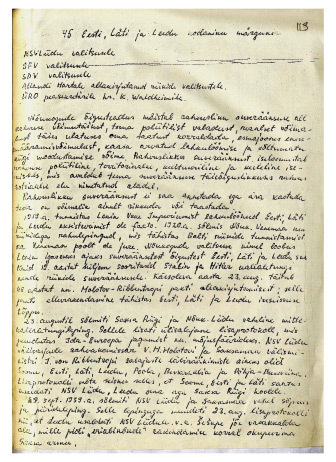 HOUSE LOG BOOK FOR THE TALLINN KESKLINN OR CITY CENTRE DISTRICT. THE MILITSIYA CHECKED THE ENTRIES. PEOPLE WHO DID NOT HAVE AN ENTRY, OR PROPISKA, WERE IDENTIFIED AND A RELEVANT NOTATION WAS MADE. 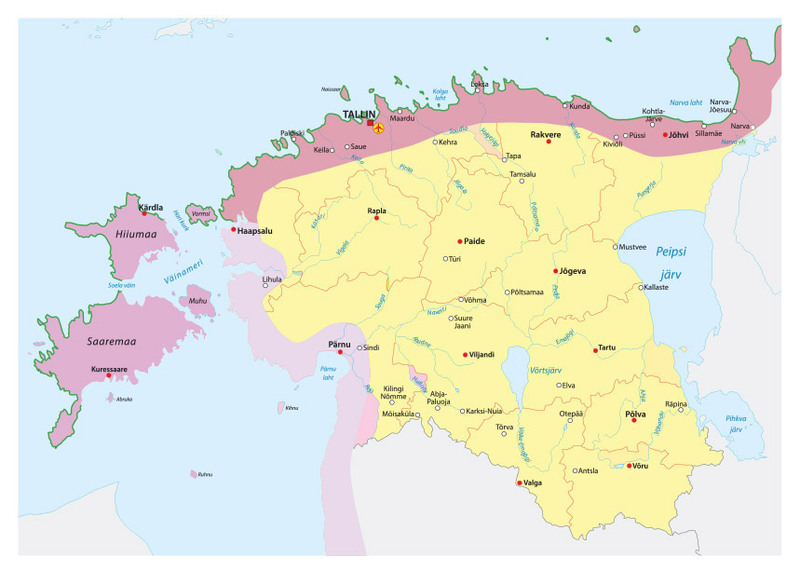 The border zone during the Soviet times included all of the islands in the Gulf of Finland and Gulf of Riga and coastal areas on the mainland. 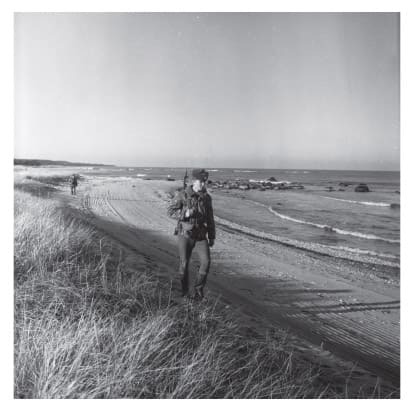 There was a set procedure for living and movement in the border zone. The coastal zone was open only to those with a passport issued by Estonian SSR Ministry of the Interior civilian police inscribed with a marking by the local border guard and bearing a special stamp. Local government bodies were obliged to erect signposts of the border zone in cooperation with the border guard. People were not allowed to take on temporary boarders in their apartments. Travel abroad was subject to even more restrictions. Before documents could be approved for travel abroad, an individual needed references from the chairman of the labour union at their workplace and the local party secretary. 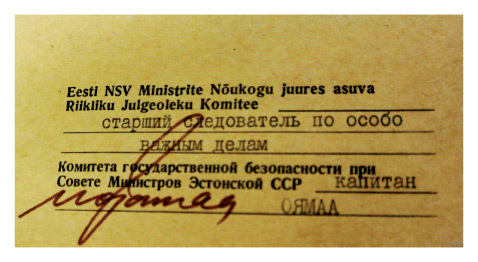 The applicant needed to fill in much paperwork, and these had to be approved by the Central Committee of the Estonian Communist Party, the KGB and the Ministry of the Interior. 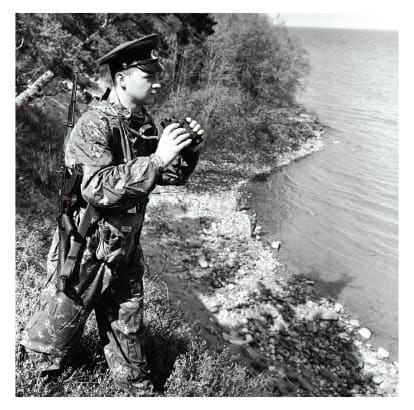 The border zone in coastal areas and islands remained “locked” for Estonian inhabitants until the collapse of the Soviet Union. 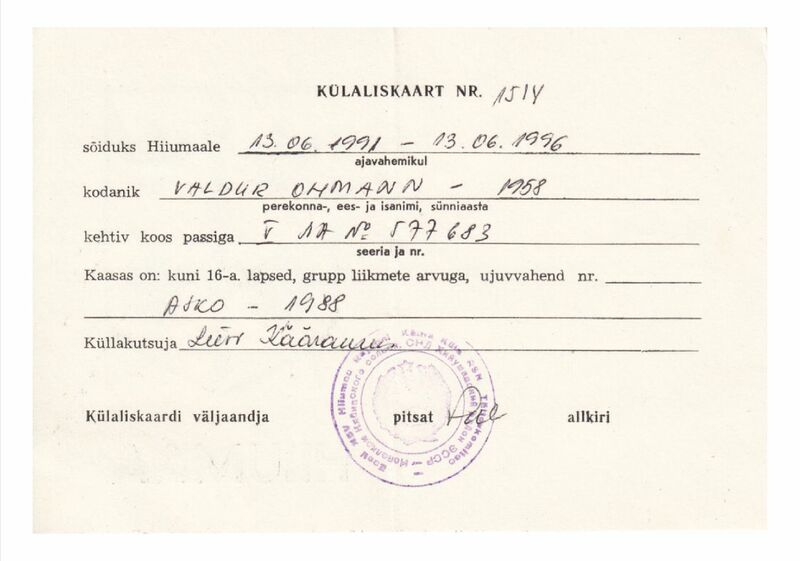 Travel to islands like Saaremaa and Hiiumaa was only possible with special permits that were checked by border guards. Travel abroad was restricted. Peeter Volkonski’s father, a well-regarded musician, did emigrate legally, but even he was labelled a “betrayer of homeland”. Close relatives of such people were called “nevyiezdnoi” – people banned from travelling abroad and whose movements were scrutinized more closely. 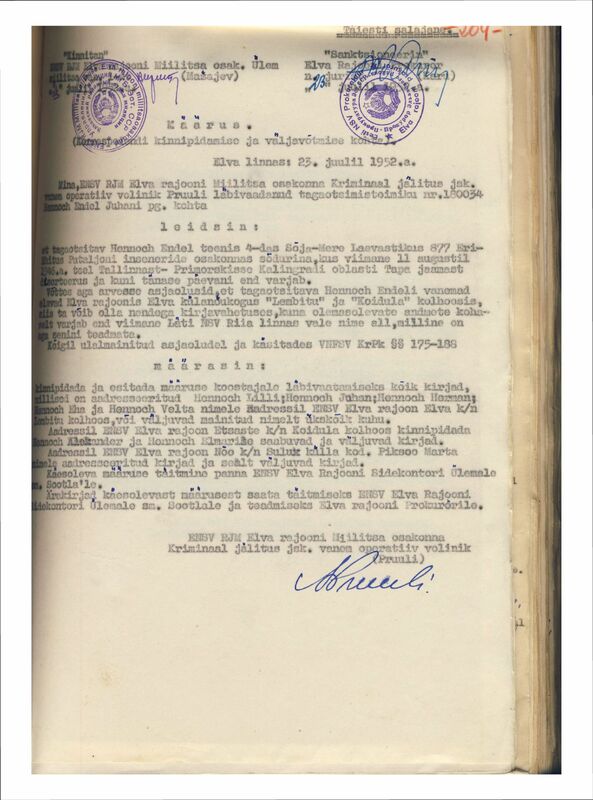 ONE OF THE LAST PERMITS TO BE ISSUED BEFORE THE COLLAPSE OF THE SOVIET UNION FOR VISITING HIIUMAA ISLAND RELATIVES. ANY JUVENILES ACCOMPANYING THE VISITOR HAD TO ALSO APPEAR ON THE PERMIT. 1991. 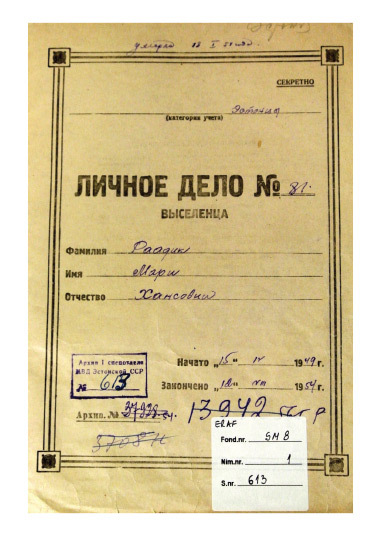 KGB DOSSIER CARDS SPECIFYING PROHIBITIONS ON FOREIGN TRAVEL FROM AS LATE AS 1989 AND EVEN 1991.